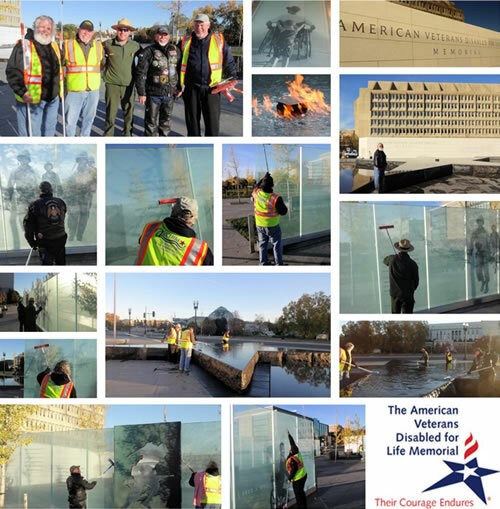 The Aleethia Foundation was honored to be selected for the inaugural cleaning of the American Veterans Disabled for Life Memorial on November 8, 2014. This memorial conveys a “combination of strength and vulnerability, loss and renewal.” The glass and granite walls represent the strength and fragility of the human spirit. There are groves of ginkgos and cypress trees which represent survival under difficult circumstances. At this sacred spot everyone will have the opportunity to “learn the important lessons of courage, sacrifice, tenacity, loyalty and honor.” The Memorial site is within sight of the U.S. Capitol, so members of Congress are always aware of the human coast of war and the need to support America’s veterans. Thanks to all the volunteers who joined us very early this morning to make sure this Memorial remains in pristine shape. Aleethia’s next scheduled cleaning of the AVDLM memorial will be on Saturday, May 9, 2015. To volunteer for the May 9th cleaning, please email Hal Koster. Army Staff Sergeant James Pierce proudly served our country to protect the American values, freedoms and ideals enshrined on the National Mall. The National Park Service has over 3,800 employees who have served in the military. After being wounded in the line of duty in 2012, James chose to honor our nation once more by preserving these iconic grounds through his work as a National Park Service park ranger and volunteer coordinator. 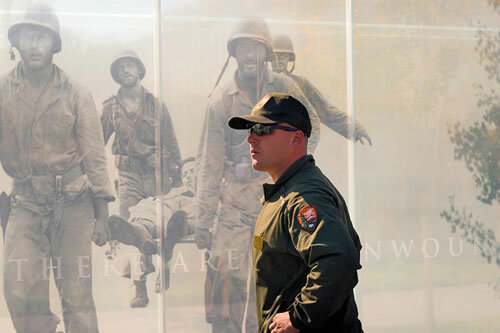 In this role, Park Ranger James Pierce, who now works at the National Mall, including the new American Veterans Disabled for Life Memorial, said, “I am very proud to be part of the National Park Service where I can continue to serve and give back to my country, just in a different uniform. Working at national memorials that are dedicated to those who have fought and died for our freedom means everything to me."